Dialogue with our community has resulted in great support for the Laneway, with clear input that improvements to the project were possible. We have worked to update the project to match the dialogue we've been part of. This redesign fully removes the 6th story penthouse and steps back the 5th story significantly. 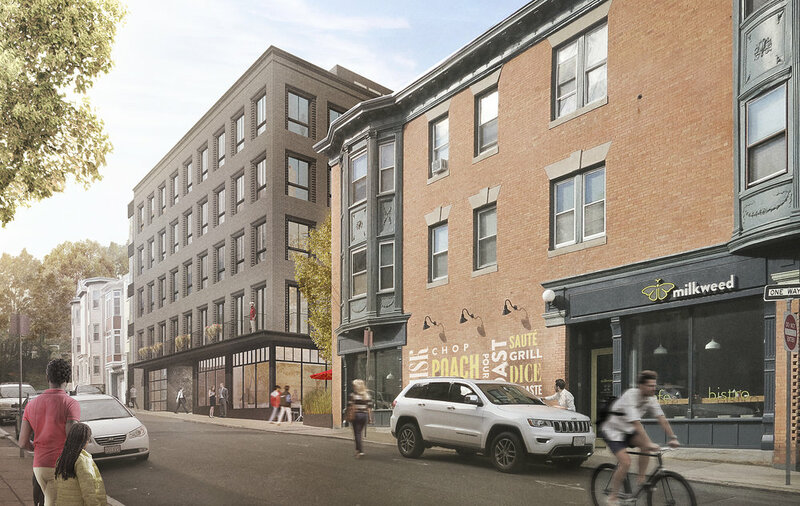 As you can see in the renderings below, the result is a building scale that is more harmonious with Burney Street. The new building design reduces the height from approximately 65' to 44’ in the front and 54’ in the rear. In addition, the project removed a significant about of density, and is now planned for 25 units. We are thrilled that we have been able to make these modifications while preserving the design for the Laneway as a neighborhood amenity. 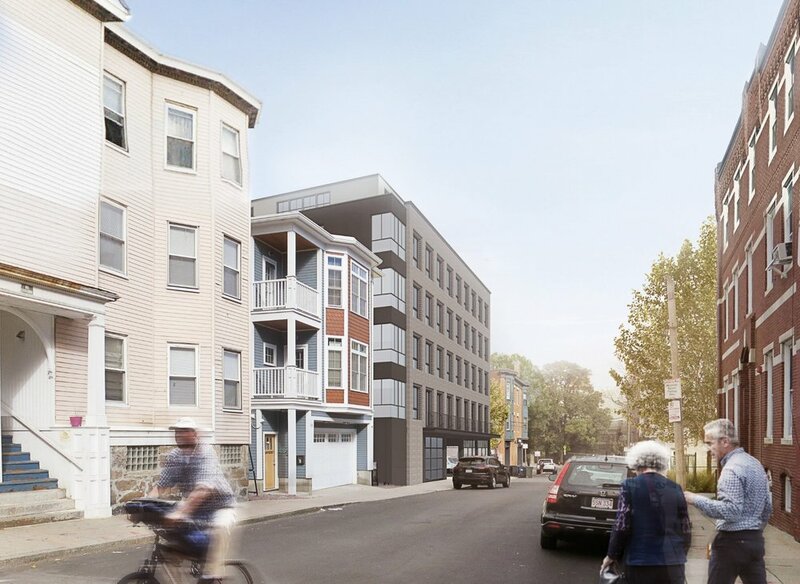 The site sits within the Mission Hill neighborhood of Boston and will be considerate of input from the community as we navigate the design process. The immediate context varies widely in its architectural style and era. Much of the neighboring properties are residential. As such, the facades of our building are driven by factors ranging from historic references to urban scaled responses, to adjacent conditions as well as more sustainable criteria such as maximizing the benefits of the sun. The unit interiors are intended to be open plans with generous light and air to create exceptionally livable homes for the residents. Historically, Tremont Street has been an architectural line of demarcation between Boston’s brick masonry buildings and its wood framed “streetcar” neighborhoods. Brick tends to be the material of the buildings along Tremont Street while the wood-framed buildings tend to populate the ladder streets which branch off from Tremont Street. In response to our specific local condition, we are proposing a two-part design with brick on the facades that are most visible to Burney Street and the Laneway sides of the building, and a lighter panelized facade system on the sides of the building which are most proximate to the nearby wood-clad buildings. The decision to use brick is specifically intended to elevate the overall material quality of the facades while signifying the retail uses on our ground floor and to continue the tradition of brick that is found throughout the structures on Delle Avenue just to the south of the site. The detailing on these facades will pick up on the nuances, depth, and shadow play of the historic buildings nearby. At the ground level retail and lobby, the building will have a more transparent base appropriate for those more public uses. Above the base on Burney Street and over the Laneway we are proposing Juliet balconies which will serve to activate the outdoor spaces around the building and encourage more life on the street. The fifth-floor penthouse will be set back from the face of the lower floors to creatively reduce the overall scale impact of the building and clad in a panel material. The older historic buildings in the neighborhood range from three families and larger multi-family buildings, to schools, civic buildings, and the cathedral. As such, the shifting scales in the neighborhood are often hard to bridge. Frequently, smaller residential buildings are composed in a series by party walls creating the look and feel of much larger buildings. More recently, newer buildings of a larger scale have been proposed and built in close proximity to the project site. We are proposing a building that will have four floors of residential units and a penthouse with residential units and a common community room over a ground floor retail/lobby base. The fifth-floor penthouse is set back from the perimeter of the building. Our site is also on the lower slopes of the Mission Hill which rises to the south of our project putting the neighboring upslope buildings on a higher footing than our building. The second-floor windows have Juliet balconies just above the sidewalk and the Laneway. This feature presents a welcoming pedestrian scale to the parts of the building which interface most with the public realm. The scale of the proposed building is consistent with the newer development in the neighborhood and bridges the scale gap between the historic residential buildings and the historic institutional buildings.